Spring is perfect for kite flying. Flying is great fun, but it can, at best, become a nuisance to the unconverted, so please be considerate of others and remember that buzzing over peoples' heads may look like fun but can be extremely dangerous. So if you want to show off your skills, don't do it at the expense of others. Play hard, but play safe - nothing stops the fun faster than an injury! Don't fly near people, especially young children. Don't fly close to roads. Landing a kite in a road could cause a serious accident. Don't fly your kite in winds stronger than recommended. Don't underestimate the power of the wind. Always wear gloves when flying a hard-pulling kite. Although it's unusual for dogs to attack kites while still in the air, always make sure there are no dogs around when you land your kite. They are known to run away when a kite lands, but in some instances, they've been known to grab the kite and run away with it. 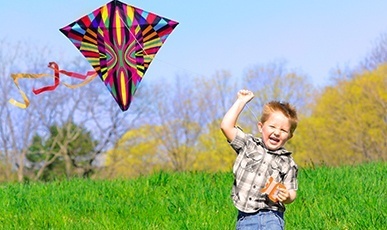 Don't let a young child fly a kite that needs more than a 30-pound flying line. Always accompany them on their first flights. Abandon a kite before risking your life to rescue it from trees or telephone poles. In the long run, you'll be better off buying a new kite.